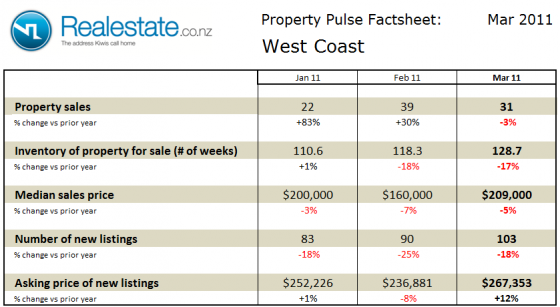 The West Coast district region property pulse factsheet for July 2012 is published using data from Realestate.co.nz and REINZ (Real Estate Institute of NZ). Property sales on the West Coast of the South Island at 38 in the month fell on a seasonally adjusted basis in July but was up 15% as compared to a year ago. The inventory of unsold houses on the market rose to 73 weeks. This level continues to see inventory well below the long-term average of 104 weeks of equivalent sales. Median sales price of properties sold on the West Coast at $215,000 was down 2% as compared to a year ago, but up on the prior month. The asking price expectation of new listings though was up 9% as compared to a year ago at $270,892. The level of new listings coming onto the market in July at 103 was up as compared to prior month and up a very significant 53% as compared to a year ago. This data indicates that the West Coast district continues to favours sellers in the market although the recent fall off in sales matched to the rise in new listings is moving the market back into a more balanced position. The West Coast district region property pulse factsheet for June 2012 is published using data from Realestate.co.nz and REINZ (Real Estate Institute of NZ). 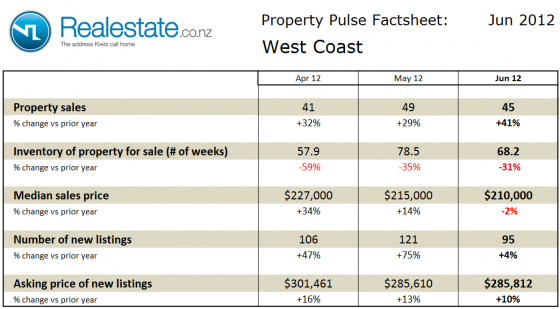 Property sales on the West Coast of the South Island at 45 in the month fell on a seasonally adjusted basis in June but was up a significant 41% as compared to a year ago. The inventory of unsold houses on the market fell to 68 weeks, reversing a strong rise seen in May. This level continues to see inventory well below the long-term average of 106 weeks of equivalent sales. Median sales price of properties sold on the West Coast at $210,000 was down 2% as compared to a year ago and down on the prior month. The asking price expectation of new listings though was up 10% as compared to a year ago at $285,812. The level of new listings coming onto the market in June at 95 was down as compared to prior month and up just 4% as compared to a year ago. 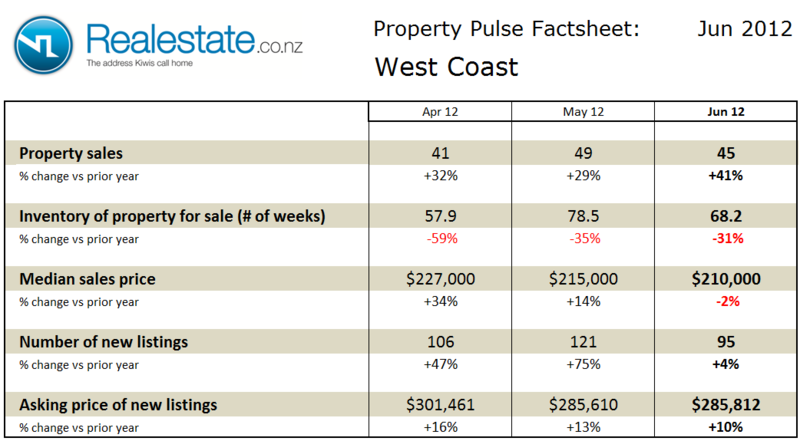 The West Coast district region property pulse factsheet for May 2012 is published using data from Realestate.co.nz and REINZ (Real Estate Institute of NZ). Property sales on the West Coast of the South Island at 49 in the month rose on a seasonally adjusted basis in May and were up 29% as compared to a year ago. The inventory of unsold houses on the market rose slightly at 78 weeks, yet still lies well below the long-term average of 106 weeks of equivalent sales. Median sales price of properties sold on the West Coast at $215,000 were up 14% as compared to a year ago but down on the prior month. The asking price expectation of new listings though was up a significant 13% as compared to a year ago at $285,610. The level of new listings coming onto the market in May at 121 was up as compared to prior month and up a significant 75% as compared to a year ago. 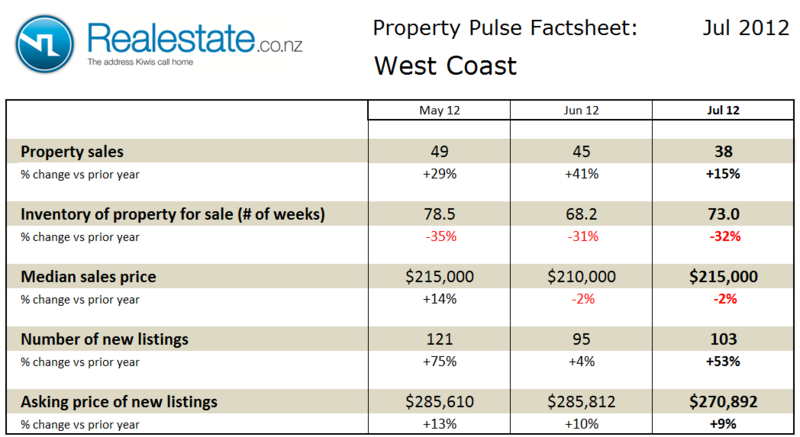 The West Coast district region property pulse factsheet for November 2011 is published using data from Realestate.co.nz and REINZ (Real Estate Institute of NZ). Property sales on the West Coast of the South Island at 45 in the month rose significantly on a seasonally adjusted basis in November and was up 25% as compared to a year ago. The inventory of unsold houses on the market remains stable at 77 weeks, well below the long-term average of 106 weeks of equivalent sales. Median sales price of properties sold on the West Coast at $198,000 was down just 1% as compared to a year ago and down on the prior month. The asking price expectation of new listings though was up a significant 25% as compared to a year ago at $315,993. The level of new listings coming onto the market in November at 105 was up slightly as compared to prior month and was down just 1% as compared to a year ago. 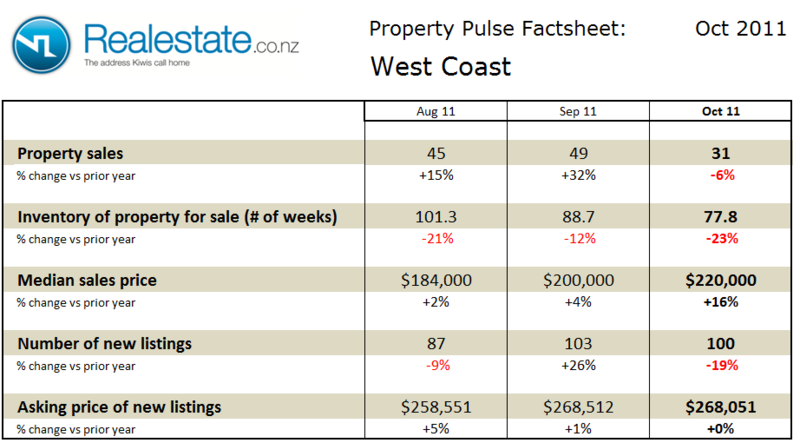 The West Coast district region property pulse factsheet for October 2011 is published using data from Realestate.co.nz and REINZ (Real Estate Institute of NZ). 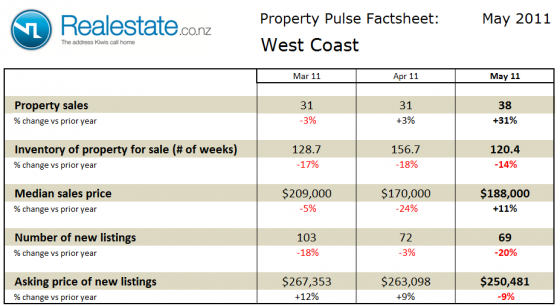 Property sales on the West Coast of the South Island at 31 in the month fell significantly on a seasonally adjusted basis in October and was down 6% as compared to a year ago. The inventory of unsold houses on the market fell again dramatically to 78 weeks, well below the long-term average of 106 weeks of equivalent sales. Median sales price of properties sold on the West Coast at $170,000 was down a significant 24% as compared to a year ago and down on the prior month. The asking price expectation of new listings though was up a 9% as compared to a year ago at $263,098. The level of new listings coming onto the market in October at 100 fell slightly as compared to prior month and was down 19% as compared to a year ago. 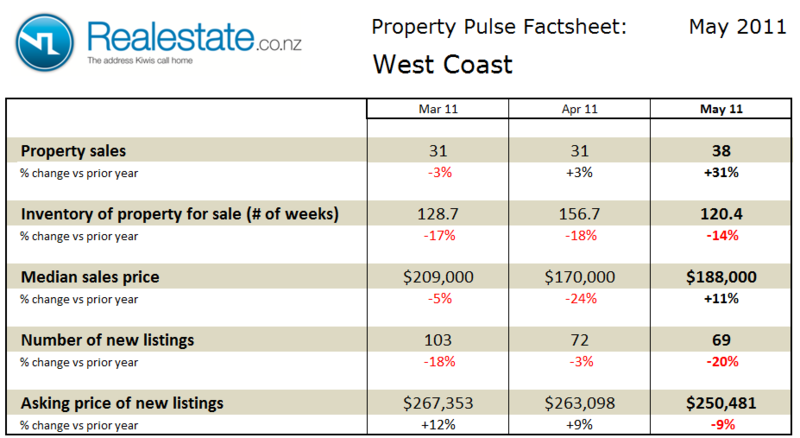 The West Coast district region property pulse factsheet for May 2011 is published using data from Realestate.co.nz and REINZ (Real Estate Institute of NZ). Property sales on the West Coast of the South Island at 38 in the month rose on a seasonally adjusted basis in May and were up a significant 31% as compared to a year ago. The inventory of unsold houses on the market fell to 120 weeks to remain well above the long-term average of 106 weeks of equivalent sales. Median sales price of properties sold on the West Coast at $188,000 was up 11% as compared to a year ago and up on the prior month. The asking price expectation of new listings though was down 9% as compared to a year ago at $250,481. The level of new listings coming onto the market in May at 69 fell as compared to prior month and was down 20% as compared to a year ago. 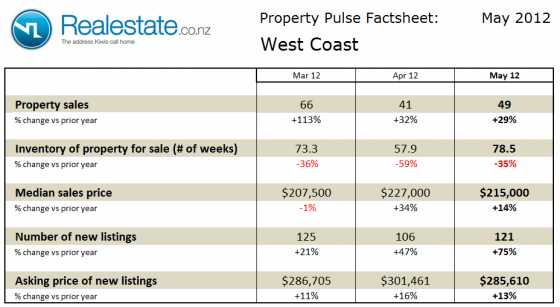 The West Coast district region property pulse factsheet for April 2011 is published using data from Realestate.co.nz and REINZ (Real Estate Institute of NZ). Property sales on the West Coast of the South Island at 31 in the month rose on a seasonally adjusted basis in April and were up 3% as compared to a year ago. The inventory of unsold houses on the market rose to 156 weeks to remain well above the long-term average of 106 weeks of equivalent sales. The level of new listings coming onto the market in April at 72 fell as compared to prior month and was down 3% as compared to a year ago. 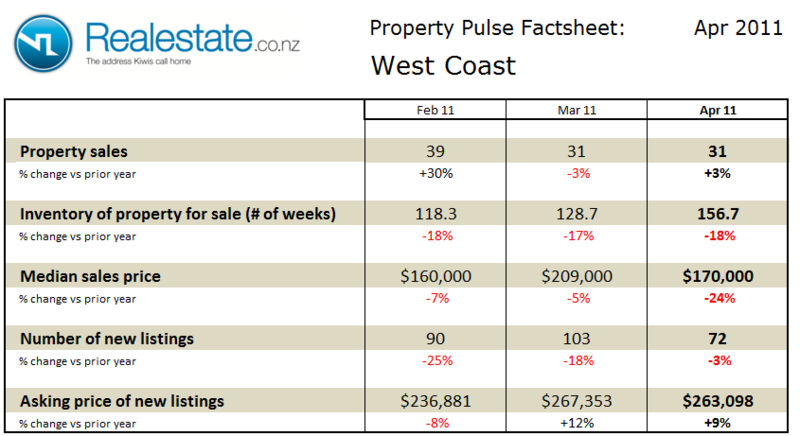 The West Coast district region property pulse factsheet for March 2011 is published using data from Realestate.co.nz and REINZ (Real Estate Institute of NZ). Property sales at 31 in the month fell on a seasonally adjusted basis in March and were also down 3% as compared to a year ago. The inventory of unsold houses rose to remain above the long-term average at 128 weeks of equivalent sales. Median sales price at $209,000 was down 5% as compared to a year ago, but up significantly on the prior month. The asking price expectation of new listings was also up a significant 12% as compared to a year ago at $267,353. The level of new listings coming onto the market in March at 103 rose as compared to February and was down 18% as compared to a year ago. 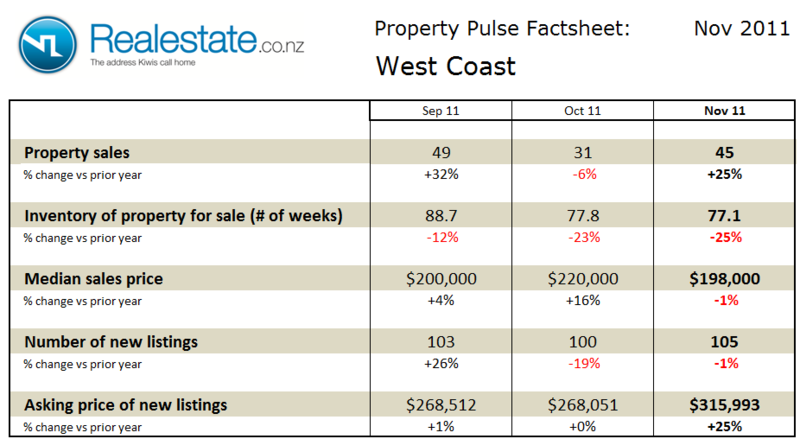 The West Coast region Property Market factsheet for October 2010 can be downloaded by clicking this icon. 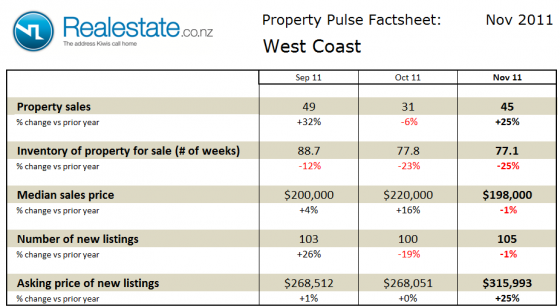 Property sales on the West Coast slipped in September on a seasonally adjusted basis by 19% with sales of 37 properties down from 39 in August. Over the first 9 months of 2010 a total of 277 properties have been sold as compared to 278 in the same period in 2009. Inventory of houses on the market fell again in September from 127 to 101 as measured on equivalent weeks of sale basis. This level of inventory is now in line with the long term average of 99 weeks. This would indicate that the market is more balanced. Property prices for the West Coast are included in the broad Canterbury / West Coast regional median property price, in September this price was $297,500 down 4.5% on September 2009 price. 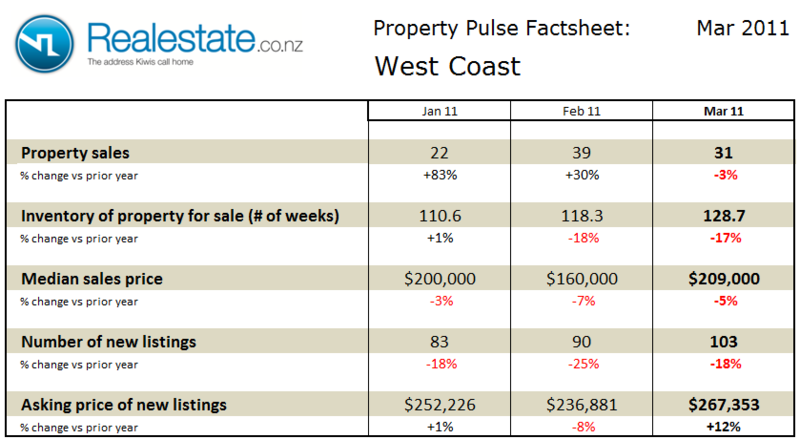 The West Coast district region Property Market factsheet for August 2010 can be downloaded by clicking this icon. 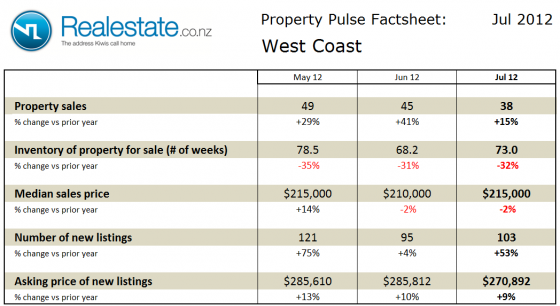 Property sales on the West Coast slipped in July on a seasonally adjusted basis by 17% with sales of 32 properties down from 36 in June. On a moving annual basis sales are up 12.7% with 374 properties sold in the last 12 months as compared to 332 in the prior 12 months. Inventory of houses on the market fell from 161 to 131 as measured on equivalent weeks of sale basis. This level of inventory is still considerably higher than the long term average of 99 weeks. This would indicate that the market is still firmly favouring buyers. Property prices for the West Coast are included in the broad Canterbury / West Coast regional median property price, in July this price was $310,000 up 4.4% on July 2009 price.